"We’re heading south again, aren’t we?" Bonnie asked as the two butterflies fluttered through the clouds. "We couldn’t go any further north once we hit Durness, could we?" Bruce replied. "We went up the east side of Scotland and are going down the west side. I wonder what adventures will come our way on this side of the country," Bonnie said. "There’ll be a lot of fishing villages and sea birds and lets not forget the mountains," Bruce explained. "I see them. They’re beautiful and so rugged. I suppose you know all their names, Mr. Walking Encyclopedia," Bonnie snickered. "Well, as a matter of fact, I do. That one over there is Quinag. That one is Suilven. I like it. It’s very ominous. Those other two are Arkle and Canisp. As you can see, the moors are all around too," he said. "The Highland Clans lived in this area. It’s full of history." "I see. What’s that down there, on the shore of the loch? Is it a castle?" Bonnie asked. "I believe that is the ruins of Ardveck castle and that is Loch Assynt. It looks cold, doesn’t it?" "It’s dark and looks deep and yes, cold," Bonnie agreed. "Should we head to that village? It’s called Lochinver. Or would you rather land in the hills and run into a few wildcats, deer and eagles?" Bruce questioned. "I think the village is just fine," she replied. They fluttered down and landed on the roof of one of the houses. "What is that?" Bonnie asked. "What? Where?" Bruce replied, wondering what she was talking about. "That! The red thing with the long tail?" Bonnie answered. "Over there. It’s standing on the chimney of that house." "I don’t know. Be careful and we’ll check and see," Bruce said. They flew over to the rooftop. The large bird was perched on the stones of the chimney, watching them. "Squawk! Hi!" it said. "Pretty bird," it squawked again. "It talks," Bonnie whispered to Bruce. "I want a cracker," it said again. "I’ve never seen a bird like that. Look at it. It’s got red feathers, brighter than any apple I’ve seen and its also got yellow and blue feathers. Look at that tail!" Bruce said. "I’m looking at the beak. It looks like it would like to eat us, not crackers," Bonnie said, shivering with fear. "My name is Dominick. I’m from the Caribbean," the large bird said. "I’m a parrot." "A parrot? What’s that?" Bonnie wondered. "What are you doing in Lochinver? This is a long way from the Caribbean," Bruce said to the parrot. "I am a pet of Ian McGregor. He went out and left his door open, for the first time. I can’t believe he was so careless. I walked right out the front door and flew up to the chimney. I didn’t know Lochinver was such a nice little town, though a bit cold for my likes," Dominick squawked. "You like to talk, don’t you Dominick," Bonnie laughed. "You don’t eat butterflies, do you?" she asked. "No, just fruit and bird seed, nuts and all that," he replied. The butterflies moved closer. "Bruce can tell you all about Lochinver and the area. He learned a lot when he was down south," Bonnie boasted. "Oh, he can, can he? Well, Bruce, why don’t you tell me something interesting? What’s the name of that big mountain or stone over there?" the parrot asked. "It’s called Suilven. It’s rather magnificent, isn’t it?" Bruce said. "I’ve noticed the places have odd names around here. Why, some days I can’t understand a word Ian is saying," Dominick said. "He’s speaking Gaelic," Bonnie answered, proud that she remembered. "I did hear him say there was some good salmon and trout fishing in the rivers around here. This is a big fishing port too. I don’t like fish. I suppose you two don’t either," Dominick squawked. "No, we like flowers. Say, are there any flowers around here?" Bonnie asked. "Follow me," he called and flew off. The butterflies had to flap their delicate wings quickly to stay up with him. "Here you are. This here is auld Ms. Maggie’s house. She’s got a lovely garden. I’ve never seen it but have heard Ian and his mates talking about it. Let’s go and see what she’s got." They walked into the back garden. "Ah, look, Bonnie," Bruce said, excited. "It’s a rose garden. We’re in heaven!" Bonnie didn’t wait. She flew right over and started sipping nectar. "Mmmmmmmm. This is good." Dominick bit a petal and chewed it. "Can’t say I like roses too much. Now, give me a piece of melon, or apple, and I’ll follow you anywhere," he said. "Oh, there you are," Ian said, walking up to the rose bush. "What are you doing in Maggie’s back garden? I didn’t know you liked roses, Dominick." Ian picked Dominick up and carried him home. "Well, that was interesting. Here we are in northern Scotland and find a bright red parrot, who talks and likes to eat apples and melons. Now that’s something you don’t see every day!" Bruce said. "Hee hee hee hee hee," Bonnie laughed. "Let’s finish our rose nectar and then we’ll go and say goodbye to him. They stay a while longer and then fluttered down the street to Ian McGregor’s house. Bonnie looked in the window. Dominick was standing on his perch, nibbling on a piece of apple with red skin. Bruce tapped on the window. Dominick looked up. "Cheerio, Dominick," Bruce waved. Dominick squawked loudly, "TTFN," and went back to eating his apple. "We might as well go on," Bonnie said. "Let’s head south where it’s a wee bit warmer." 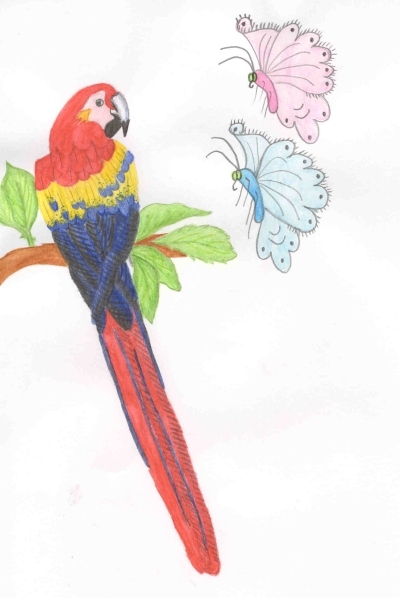 The two butterflies fluttered away, leaving the squawking parrot behind them.